With enriched industrial experience and knowledge, we are providing an excellent range of Cotton TFO Machine. We have gained a remarkable position in the market that is involved in offering Cotton TFO Machine. Price Range : Rs. 300000 to 550000 Per Unit. We are a reputed name in the industry, devoted towards offering the best quality array of Double Deck Cotton TFO Machine. Chhaya Engineering Co. is offering a wide range of TFO machinery for spun yarn. It is environment friendly in the sense that it has a very low noise level. 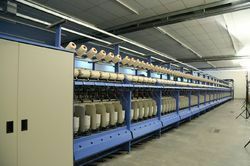 We are offering a TFO machinery spun yarn at a competitive leading price. The TFO twisting machines comprises a superior quality gear change system for all types of settings.